All of our applications include ongoing service and support. Your portal to a comprehensive suite of channel management solutions that will effectively help you administer all of your channel processes. Be the first to find out about the newest and innovative solutions in Channel management and special offers by Computer Market Research. Best tools, practices, and strategies to optimize channel partner motivation, performance, loyalty, and utilization of marketing funds that accelerate marketing productivity and maximizes channel revenue. Learn how to drive business growth through effective channel partner management, streamline the partner onboarding process, enhance partner mindshare, help accelerate partner performance and sales execution, extend marketing reach, and capitalize on unexplored markets. Channel sales articles cover sales topics that assist you in galvanizing partner objectives. We discuss topics that demonstrate best practices and tactics for your indirect sales funnel that help enhance productivity, transparency, loyalty, longevity, and success with your channel. Partner Portal articles provide you with the information on what a powerful partner portal can offer you and your channel partners. By utilizing a partner portal vendors, distributors, and resellers can have tangible visibility into their sales funnel. Selling products via partner ecosystems is no easy feat. That’s why channel incentive program creation and implementation is so important to channel vendors; it gives you the opportunity to demonstrate your unique value as a business partner. However, given the challenges associated with utilizing channel partners—inefficient access to data/analytics tracking program ROI, partners’ ineptness in marketing, complex program processes, etc.—it’s no surprise why selling “direct” has so much appeal to vendors due to its straightforwardness and familiarity. Additionally, helping partners adjust to new business models (i.e., the transition of traditional processes to cloud-based technologies) has caused relationships to experience friction and incompetence. 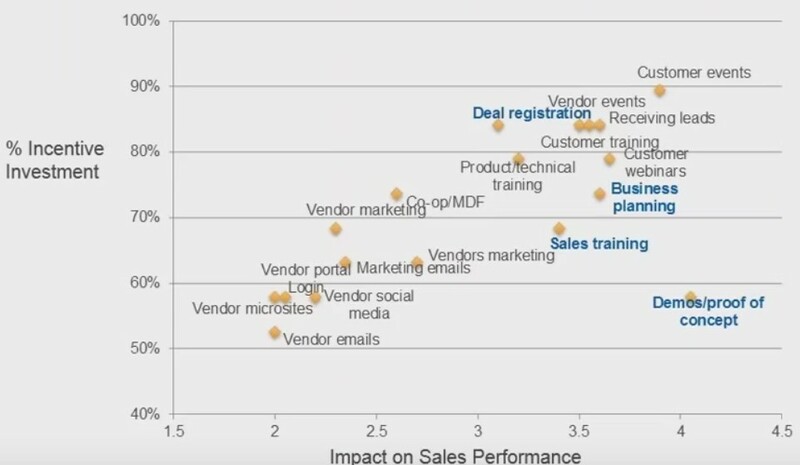 Given these differences, vendors frequently struggle to recruit, manage, train and sell to partners. So, how do vendors transform these challenges and into moneymaking opportunities? What areas in the channel require the biggest investment that will enable partners to grow, sell and be successful? How do you better align your promotional strategies against your objectives? How do you influence the behavior of channel partners so that they are mutually beneficial? Proper channel incentive program creation mandates a strategic approach. In order to improve the effectiveness of your indirect sales channels, regardless of the industry, your channel incentive programs and reimbursement opportunities require thorough management and mindful execution. Vendors spew out incentive programs faster by the day. “How do I know my programs are working?” is a question many channel managers struggle to answer. “How much should I be spending overall?” – In order to maximize partner effectiveness. In order to avoid the previous challenges so often found in channel marketing, your channel incentive programs must be relevant to the strengths/weaknesses of each partner. Too often, vendors implement post-sales incentives (e.g., SPIFFs and rebates) in the hope that commission-like benefits will lead to more closed deals. Although SPIFFs and rebates do gauge revenue, they should not be your only means of partner motivation. Tiered pre-sales incentives—although time-consuming, more complex and difficult to execute—offer partners with constructive, tactical opportunities for achieving success. These incentives focus on improving partners’ go-to-market strategies that lead to long-term results, not short-term perks. 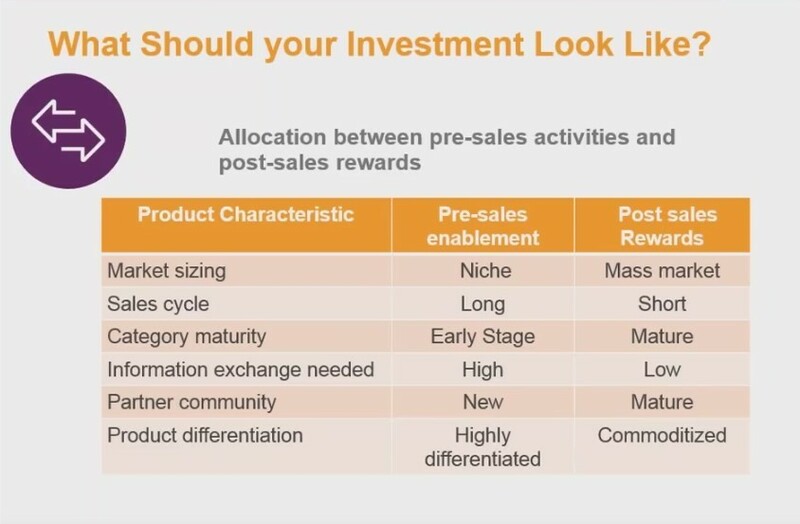 Three programs are all it takes to “package” these activities into revenue-driving vehicles (see graph below for pre/post-sale activities). In other words, you don’t need countless programs in order to achieve maximum effectiveness with channel partners; what you need is three robust, comprehensive programs strategically tailored with a definitive objective that combines multiple activities. That’s how you differentiate your business from the competition; by investing into targeted, higher-impact incentive strategies during your channel incentive program creation, you have a greater opportunity to accelerate revenue at reduced costs. In order to sustain that “competitive edge” over other businesses, you can implement several other strategies into your program. 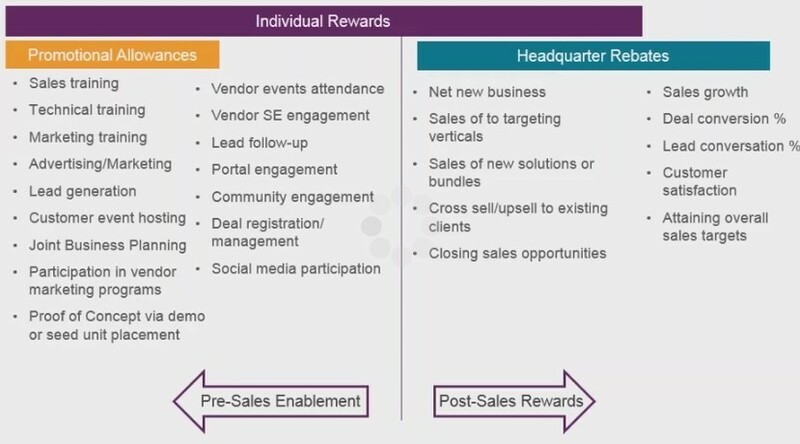 You can begin to engage better with channel partners by being more creative with the types of programs (and the activities within those programs) you offer; accelerating revenue starts with your ability to demonstrates value—and incentive programs are your best ticket to sustain long-term, joint-partner success. Copyright © 2019 Computer Market Research, Ltd. All Right Reserved.